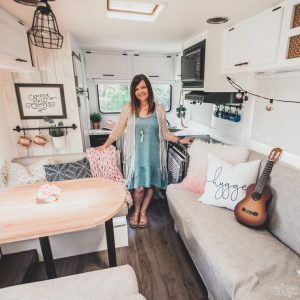 I’m so excited that we’re heading into Fall and that I get to break out all of the rich, jewel toned colours for my crafts and decor! This year, we’re hosting both Thanksgiving and Christmas dinner at our home, so I’m really looking forward to making our house feel festive and cozy for our guests. First on the list? 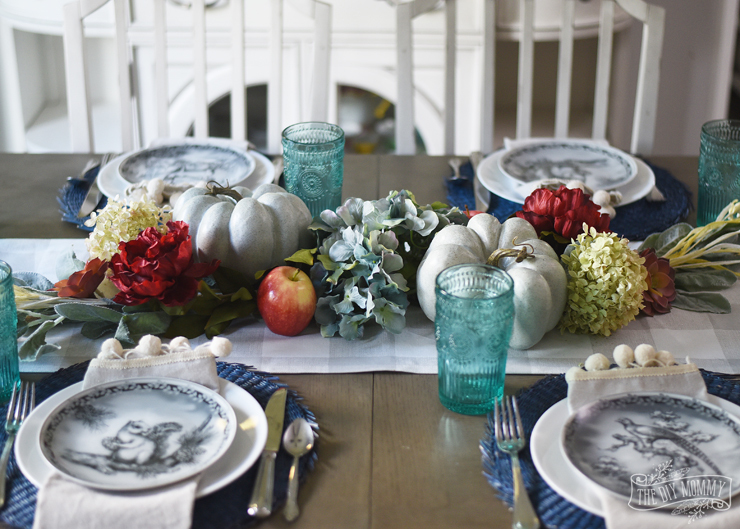 Creating a fun tablescape for our Thanksgiving Dinner! (For my American friends, we have Thanksgiving in early October.) 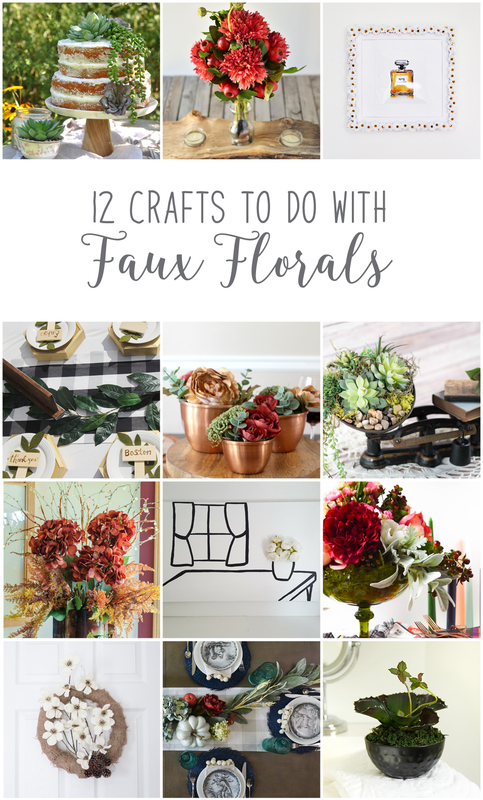 I’ve already made a simple DIY table runner, so now I wanted to dress it up with some real and faux flowers. 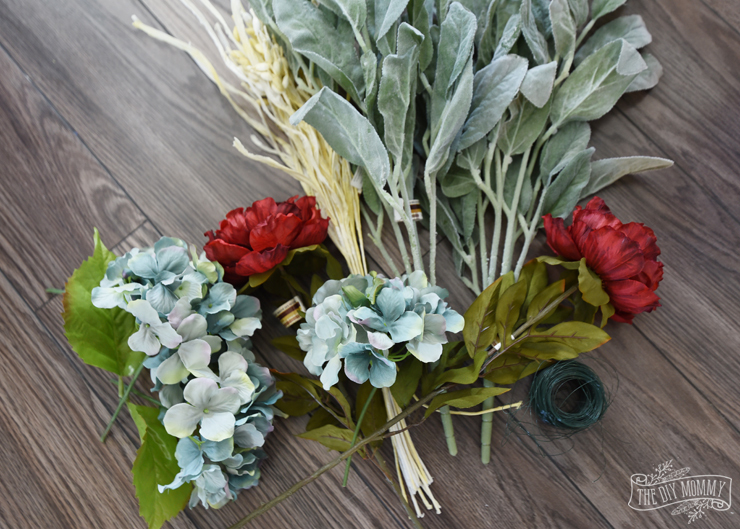 Come see how I made a pretty faux floral & leaf garland for my Fall table, plus make sure to head down to the bottom of this post to see what some of my favourite blogging friends made with faux flowers! 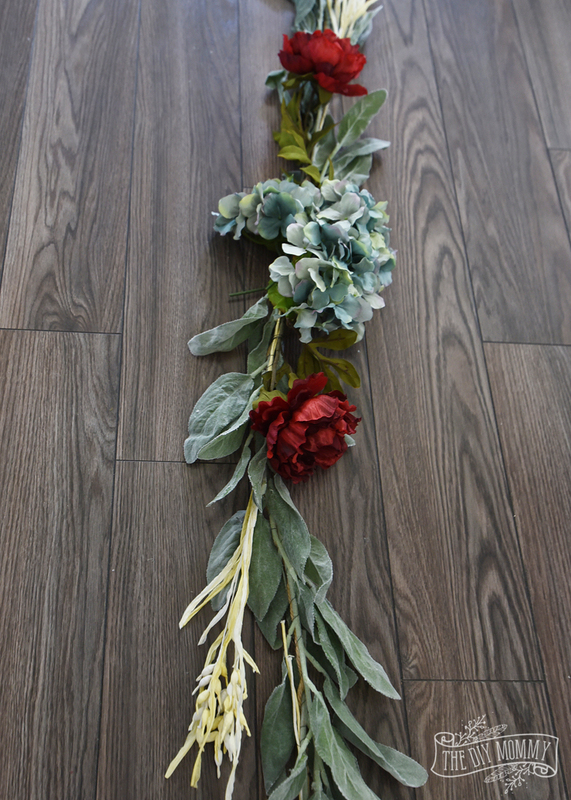 This romantic and dramatic garland acts as a wonderful base to a table centerpiece. I made the garland, laid it on my table runner, and then layered on some faux pumpkins, dried hydrangeas, faux succulents and real apples to give it more body. I think it’s such a pretty and unique way to make our kitchen table look extra festive! First, gather together your favourite faux florals. 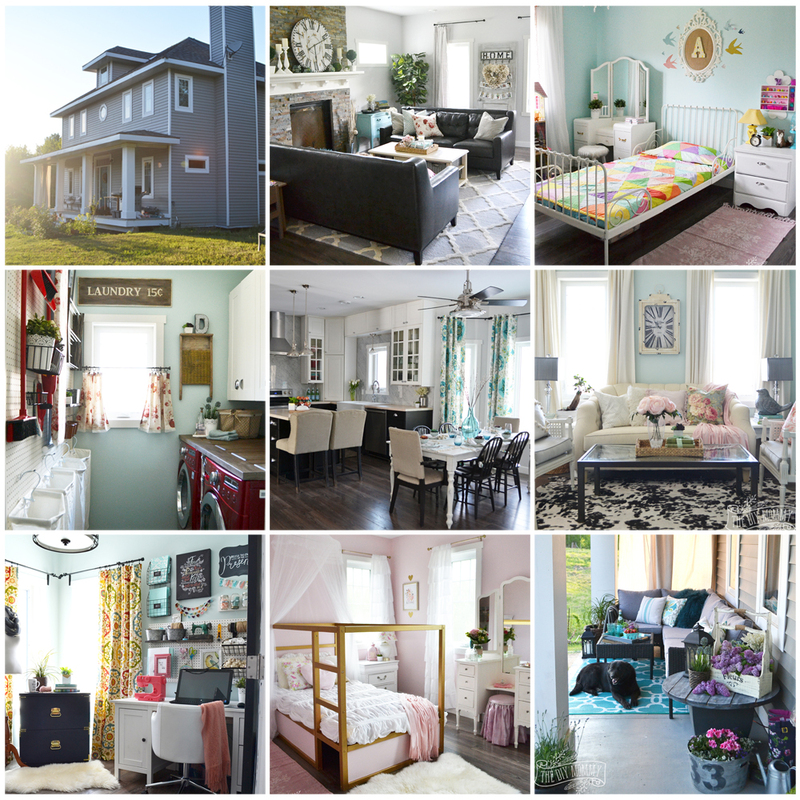 Choose a colour scheme, and find flowers and leaves that suit it. 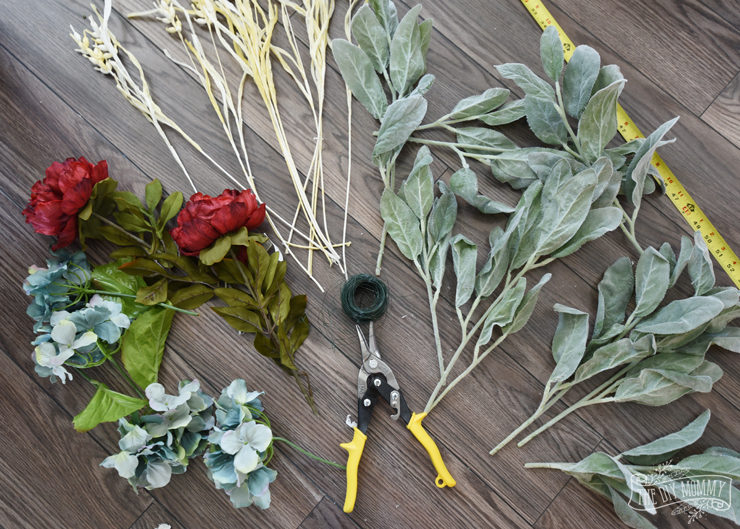 Don’t be afraid to mix lots of textures and shapes to give your garland lots of interest and make sure to buy at least a couple of bunches of a nice flat leaf for the base of your garland. Here, I’ve used lamb’s ear for the base of my garland (because I like the fuzzy texture and blue-green colour), a couple of burgundy peonies, some papery wheat, and some teal coloured hydrangeas. Next, separate the bunches of leaves and flowers into single stalks. Trim off any extra long stems. 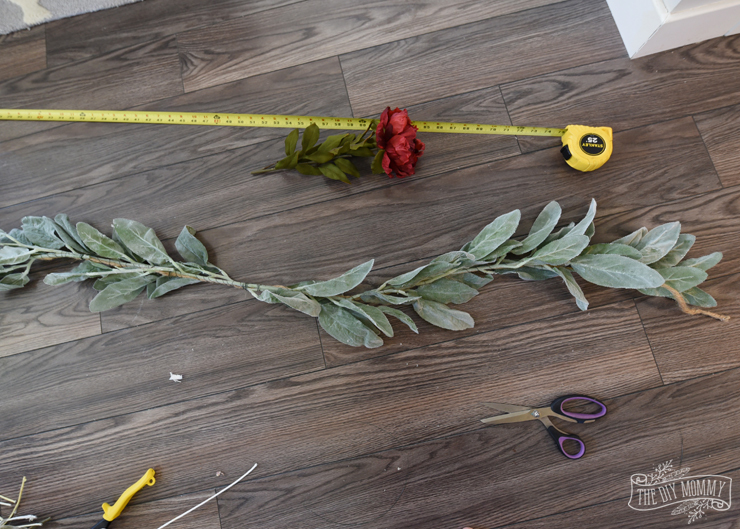 Decide on how long you want your garland to be, and measure & cut a piece of twine to that length. My garland is about 6 feet long. 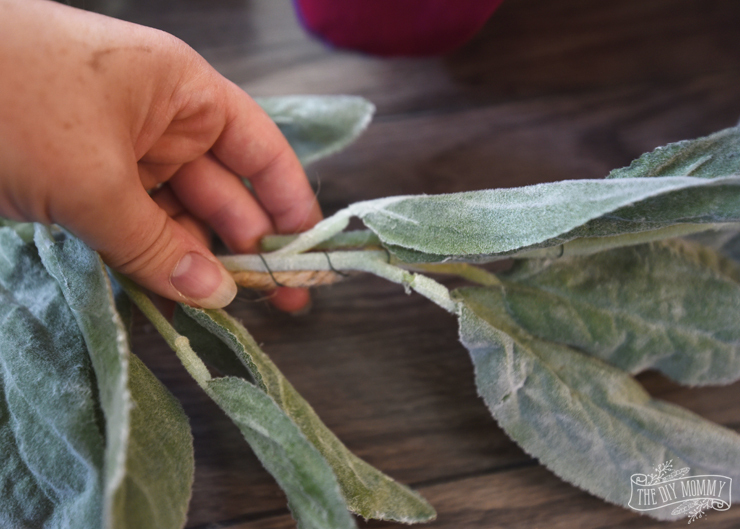 Grab some floral wire, and start attaching your flat leaf stalks to the twine by wrapping floral wire around both. 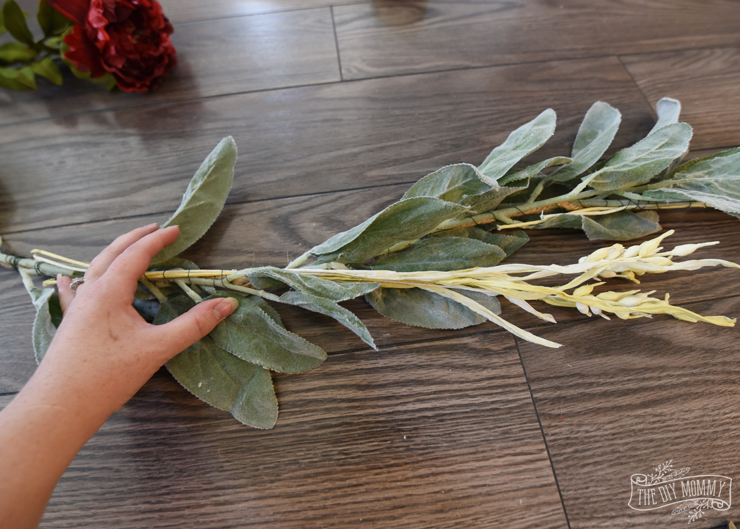 Continue to add the leaves, overlapping them as you attach them to the twine so that the garland is nice and full. I wanted my garland to be somewhat symmetrical and lay flat on my table, so I made the leaves spread out in opposite directions from the center. You could also make the leaves all go one direction for a different look. 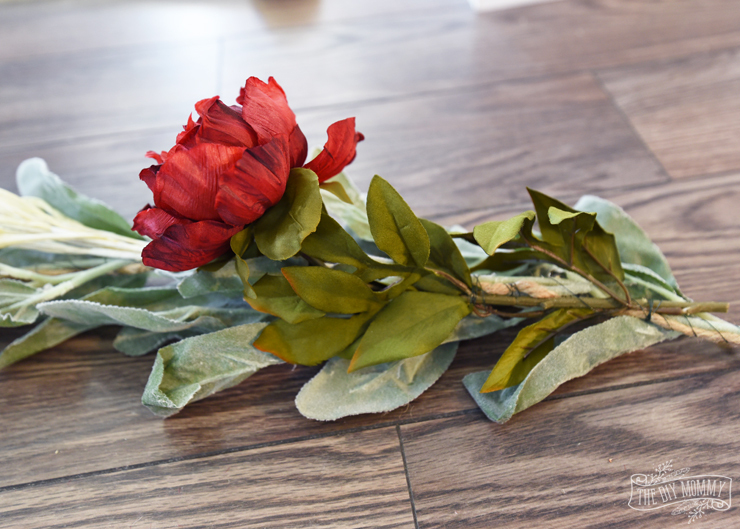 Next, start layering in your other faux leaves and flowers. I choose to add in my wheat next. 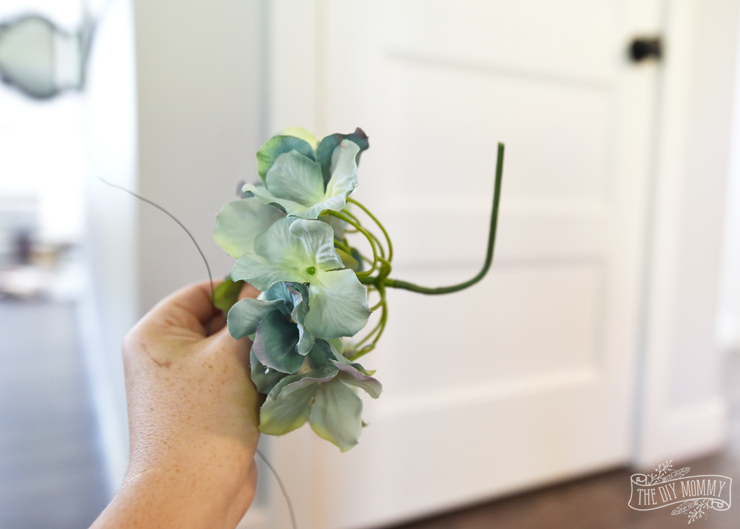 Use floral wire, and wrap it around the stems of the florals and the twine to secure them. 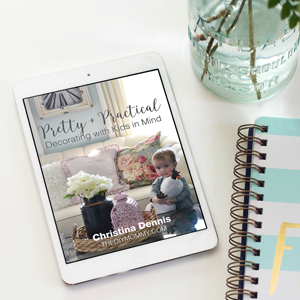 I added in a couple of peonies for body – one on each side of the center of the garland. If you decided to do a symmetrical garland like I did, you might end up with an empty spot in the center like this. To fill it, choose a full and fluffy flower or leaf like these hydrangeas, and bend the stems. Attach them to the center of the garland with floral wire, ensuring that all of the empty space is filled. 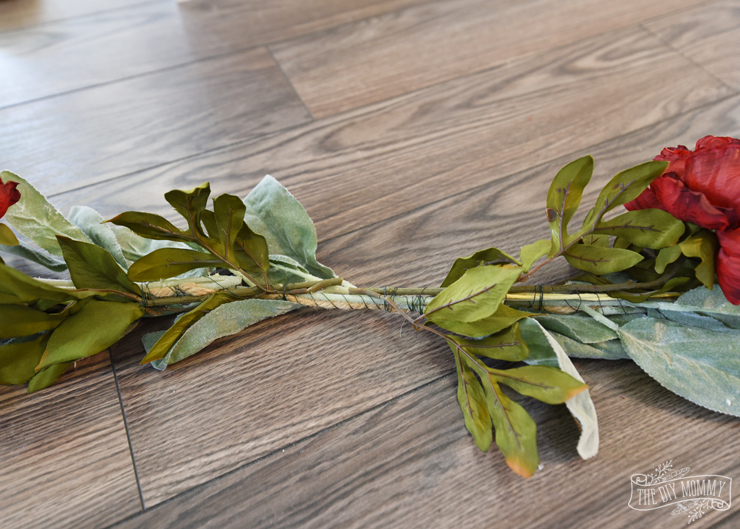 One of the wonderful things about working with fake flowers and leaves is that you can bend them any way you wish to get the look you want! That’s it! 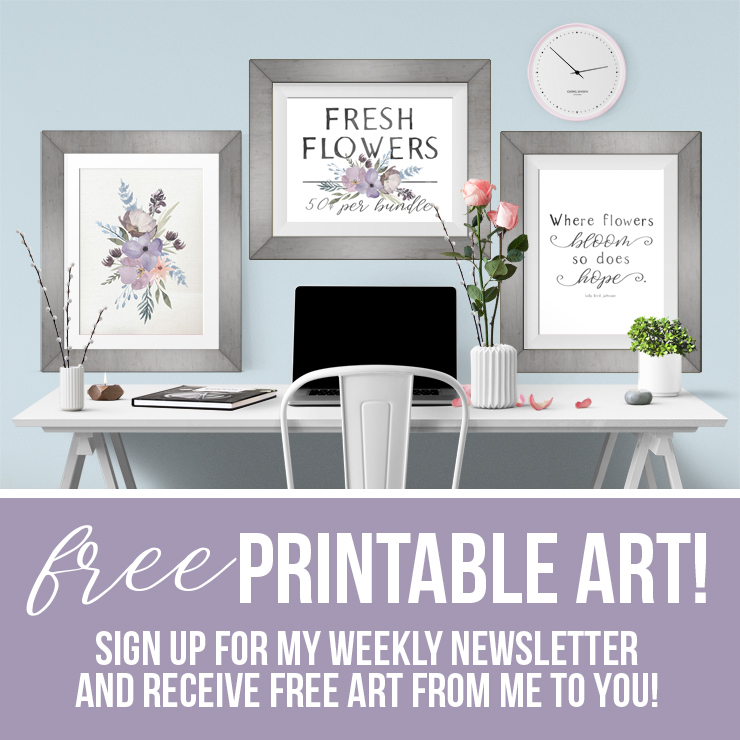 Your lovely faux floral & leaf garland is done. To dress mine up, I laid it in the center of my table and added in some faux pumpkins, faux succulents, dried hydrangea and real apples. I love mixing real flowers and fruit with fake ones to give the illusion that everything might just be real! This is beautiful! And I remember those plates from last year. 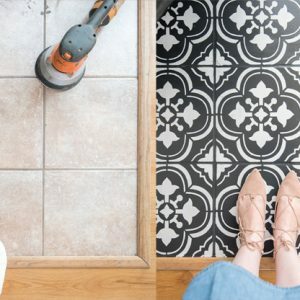 What a brilliant table decor DIY idea! Of course! 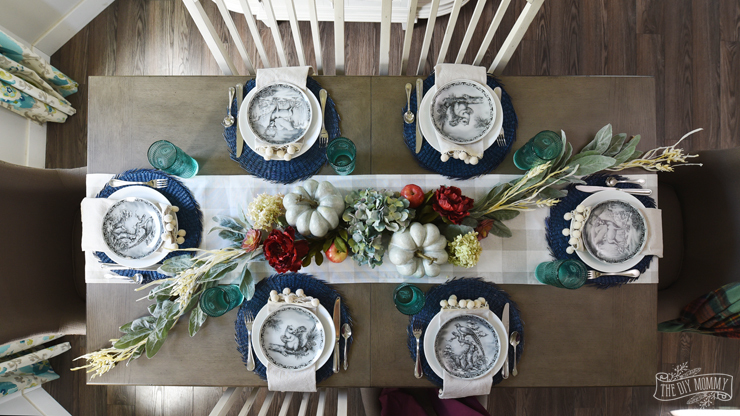 One can make a stylish tablescape fall garland.There are moments where I get excited when i come across a project and this is one of those times. Thank you for the inspiration! 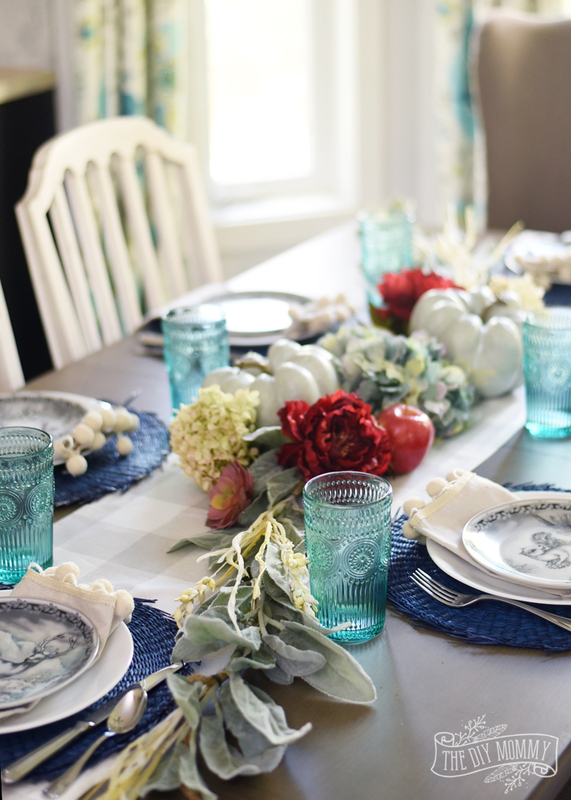 This table setting is so lovely. 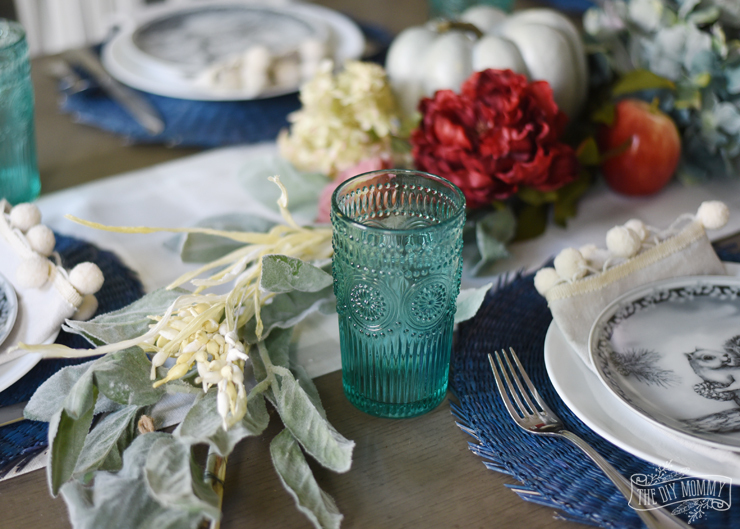 The garland paired with your checkered table runner, navy placemats and those gorgeous dishes is just perfection. The garland is beautiful! The whole table looks great actually. I love the addition of real apples. SUCH a pretty garland! I love this table 🙂 Now I have so many garland ideas! I love this table setting. Buffalo check and floral garland for the win! Those blue cups are stunning as well.